After the Easter weekend break, it is back to business for Hartpury RFC as National League rugby returns this Saturday. This will be Hartpury’s last appearance in Gloucestershire for the 2016-17 season and a bonus-point win, against bottom club Macclesfield, would mean a magnificent home record for the campaign – Played 15, Won 15, Bonus Points 15. That result would leave them going into their final fixture, at Blackheath, still with the chance of an unbeaten season – something never before achieved at this level of league rugby. On paper, at least, the clash against the already-relegated Cheshire side might appear to be something of a foregone conclusion. However, Director of Rugby John Barnes is quick to play down any suggestion that his team will take anything for granted. 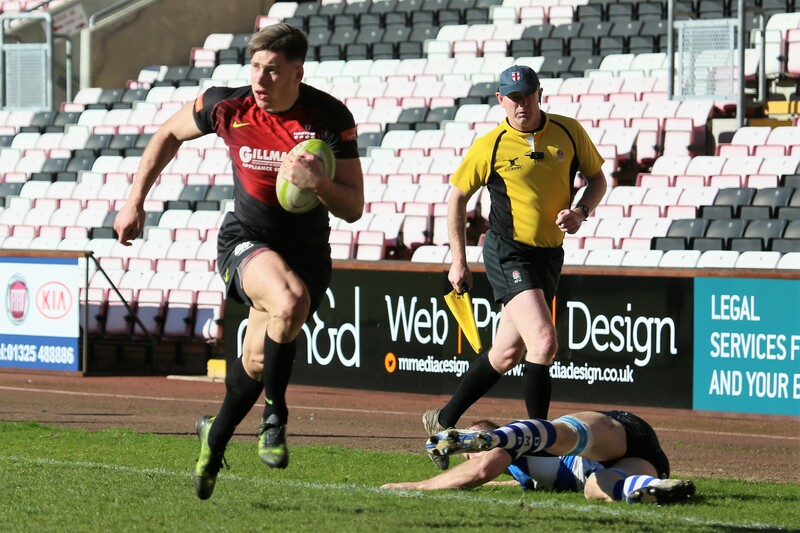 Hartpury’s last run-out was at Moseley in the warm sunshine a fortnight ago, where a 32-14 win was the outcome. How did Barnes rate the performance that day? There is no definitive team news at this stage but, with Gloucester Rugby engaged in an A-League play-off semi-final versus Wasps on Monday, there is likely to be some change in the dual-registered players available. One man known to be returning is dangerous winger Jonas Mikalcius (pictured), after he missed the match at Moseley whilst on duty at the Melrose Sevens with Harlequins – a tournament that the London club won. He will be looking to add to the 30 league tries he has already collected this season, twelve more than any other player in the division. His tally includes a brace in the reverse fixture at Macclesfield, back in December, a match won 62-12 by Hartpury.